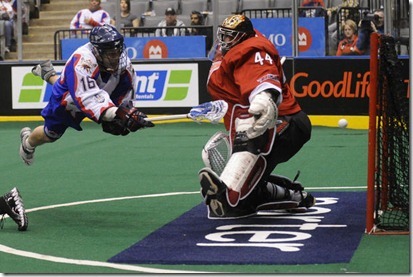 The NLL Hall of Fame: Why is "not yet" an option? Pat O’Toole, the former goaltender for the Rochester Knighthawks, Buffalo Bandits and New York Saints (!!) was elected last month to the NLL Hall of Fame. He was unquestionably deserving – 16 seasons in the league, second overall in total saves, two Championships, one Goaltender of the Year award, and he leads the Knighthawks in every goaltending category there is. He’s the third straight person to be elected into the Hall by himself, and also the third straight goaltender, after Bob Watson and Steve Dietrich. What was even more interesting about the announcement was who was not going in. Four other players were nominated: Pat McCready and Kaleb Toth both received 48% of the vote, well short of the 75% required, and Chris Driscoll and Regy Thorpe both received 21%. The 1993 Buffalo Bandits were nominated as a team and received 42%. The omission of Toth, in particular, had some heads shaking throughout the IL Indoor forums and Twitter. Many were saying he should have been a shoo-in, while others said that he was good but not quite worthy of the Hall of Fame. This begs the question: what would make a player worthy? Obviously there’s no criteria that guarantees you entry into the Hall, though being good enough for long enough to pick up 1000 career points (only 6 players have ever done it) would probably be the equivalent to 300 wins for a pitcher in baseball. But there will be lots of players that don’t get 1000 points that deserve to be in the Hall – Paul Gait, Tom Marechek, Darris Kilgour, and Dan Stroup are already in the Hall with fewer. And that number’s only useful for scorers – what about transition guys, defenders, and goalies? Finally, there’s more to Hall of Fame worthiness than just numbers. But I’m going to start with the numbers because, you know, that’s what I do. Kaleb Toth finished his 13-year career with 713 points (14th all-time) in 186 games (24th), for a career average of 3.83 (46th). He had 9 seasons (in ten years) with 50+ points (14th), and 6 seasons with 60+ points (13th). Only Andrew McBride has played more games as a Roughneck. He’s the team leader in goals, assists, and points; the next closest current Roughneck is Scott Ranger, 241 points back. So he’s 14th all-time in points. You might think well, he didn’t make the top 10. But consider this: 1243 players have played at least one game in the NLL. Only 13 have more points than Toth, putting him in the top 1.2%. Was he as dominant as guys like Grant or Tavares? No. Was he the best player on his team his entire career? No, he played with guys like Tracey Kelusky, Lewis Ratcliff, and Josh Sanderson. But it’s safe to say that he was one of the top 2 or 3 guys on the Roughnecks for eight straight years from 2002 until 2009. You also have to consider the non-stats factors. 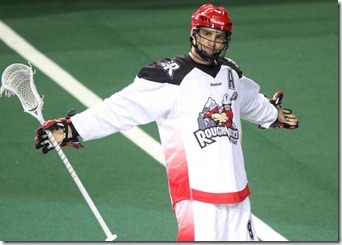 He was the face of the Roughnecks for much of his career, being a hometown Calgary boy, and Calgary is now one of the cornerstone franchises in the league. Toth spent a lot of time in the community and attempting to grow lacrosse in Alberta and from what I understand, this has been very successful. And you can’t forget his two years in Toronto, scoring one of the most famous goals in Toronto Rock history, if not league history. So I think I’ve made my case for why Kaleb Toth deserves to be in the NLL Hall of Fame. Personally, I think Pat McCready should be in there as well. It would be harder to make a similar argument for McCready, but only because he was a defender and so comparing numbers is much harder. And I’d be OK with the ’93 Bandits going in as a team. But that’s not what this article was supposed to be about. It was supposed to be looking at the question of how we decide whether or not a player deserves Hall of Fame inclusion. But other than maybe the 1000 point plateau, there’s no definite criteria for Hall of Fame candidates, so each has to be examined individually. Because the NLL Hall hasn’t been around all that long (there are only 21 people in it, 8 of which were not players), it’s a little more difficult than other sports to say “so-and-so is in the Hall, and this guy’s career was similar (or better), so he should be in as well”. But if we want to go down that road, we can. Dan Stroup is in the Hall of Fame. Toth played 4 more games than Stroup but had 184 more points. They were both forwards so logic says that if Stroup’s in, Toth should be in. The Hall of Fame is not an ordered list of players. If someone deserves to be there, vote for him. If he gets 100% of the vote, well good for him, but it doesn’t mean that he’s better than Ruth or Cobb [or Gait or Veltman]. If you think Toth is worthy of the Hall of Fame, vote for him. If you don’t think he’s good enough, that’s fine. But don’t give me this “not yet” crap. I’m not sure which I hope for more: (1) that the NLL Hall of Fame voters do not think this way (good) and they just believe that Toth isn’t good enough (bad). Or (2) that the voters do think this way (bad) and that Toth will get in next year (good). We’ll have to wait for the results of next year’s voting to see which it is. I remember it like it was twelve years ago. 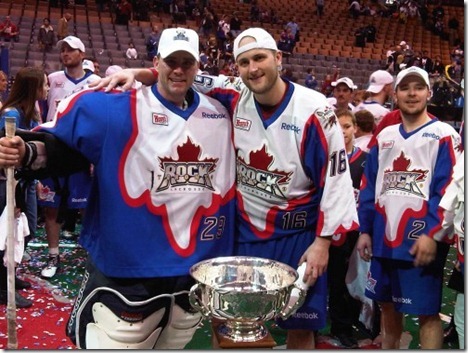 Young lacrosse star Kaleb Toth, who scored the last-second goal to give the Toronto Rock the 2000 NLL Championship, was traded to the brand-new Calgary Roughnecks for a player with no NLL experience and a draft pick. As a Rock fan, was I outraged? Did I feel ripped off? Not really. First off, I knew that Toth was an Alberta boy and being the first home-town player for this brand new team was likely a huge deal for him as well as for the Roughnecks. Secondly, the player we got back was the second overall pick in the previous draft, a strong forward named Blaine Manning. A second overall pick plus a first rounder should be enough of a return for Toth, shouldn’t it? Still, we’ve all seen first round draft picks that just didn’t work out; would Manning turn into one of those? Obviously he didn’t, and the rest is history. Manning scored 71 points (21+50) in his first season plus another 12 (4+8) in the playoffs (including the double-overtime winner in the semi-finals against the Washington Power) as the Rock won their third Championship. He was named Rookie of the Week five times, Rookie of the Month for March, and finally Rookie of the Year. Toth, for his part, racked up 79 points in his first of eight straight 50+ point seasons, became the face of the Roughnecks for a decade, and on his retirement became the first inductee into the “Forever A Roughneck” program. If there was ever a trade that worked out better for both teams, I’m not sure what it was. Manning scored 60+ points in ten straight seasons, and 70+ in all but one of those. His best season was 2005 when he scored 105 points, tied with John Grant for second in the league after Colin Doyle’s 111. Josh Sanderson was third with 102, making 2005 the only season in NLL history that three teammates scored over 100 points. At their prime, Doyle, Manning, and Sanderson formed what might be the most potent top three on any team in NLL history. Manning was not just a strong scorer who could pick corners as well as anyone. He could shoot from outside, could drive to the net through as many defenders as necessary and liked to dive through the crease as well. But there are two specific things about Manning’s play that I will remember: first, he would frequently switch hands. If there was no room to shoot right-handed or he was on the wrong side of the net, he’d flip his stick around and shoot as a lefty. I honestly don’t know how effective this was and I assume it was less accurate than his right-handed shot, but he scored numerous goals this way, catching the goalie off-guard, and I’ve rarely seen other players do it. Second, he was almost untouchable on the penalty kill. If you needed to kill some time on the shot clock, give the ball to Manning and he’d simply hold it for 20-30 seconds, regardless of the number of people pounding (or sometimes piling) on him. Mark Steenhuis is also very skilled at this but for many years, Manning was the best. Manning played in every Rock game for ten full seasons – 2002 to 2011 – but two games into the 2012 season, his consecutive game streak was halted at 162 (177 including playoff games) when he broke his collarbone. That streak was good for third place all-time after Doyle and Steve Toll, though all three have since been eclipsed by Shawn Williams. He returned in April, having missed ten games, but only recorded 9 points in his 6 games that year. Last season Manning was given a different role and was more of a “grinder”, the guy that gets in the defender’s way and thereby gives better looks to guys like Doyle, Billings, and Leblanc. But there were times where he tried to be the Manning of old and wasn’t able to. The frustration on his face was obvious, which is why this announcement was surprising to me but not shocking. Evidently the toll on his body over the last couple of years was too much, and he decided that this was the end for his playing days. Over the years of his career (2002-2013), only eight people have more points than Blaine Manning. Only one player (Bob Watson) has played more games in a Rock uniform, though Doyle will pass him this coming season. He is second in Rock history after Doyle in goals, assists, and points (both regular season and playoffs), and second after Jim Veltman in loose balls. He led the team in scoring twice and won four Championships with the Rock. Manning is certainly one of the greats in Rock and league history and should get serious consideration for the NLL Hall of Fame once he is eligible. He is one of my all-time favourite players and I wish him well in the next phase of his lacrosse career.